What is now the easiest way in the world to plaster your marketing message all over the Internet while at the same time lining your pockets with GOLD? How One Simple "Magic Move" Instantly Uncorks So Much Hidden Raw Power That You Can Go Out Tomorrow And Launch An Autopilot Stream Of Income Using PDF Documents! "Who is the Wisest Affiliate Marketer In Your Niche?" YOU ARE When You Use this Incredible New Software! In This Letter, I'll Show You A Never-Before-Revealed PDF Rebranding System With A Jealously Guarded Secret That Will Generate Sales Faster Than A Speeding Bullet. Have you ever tasted the richness of success? "This software sounds too good to be true, and theres no way on God's green earth I'll ever figure it out." But I have to tell you, it's so simple a 5th grader could do it! Picture yourself on the leading edge (by the way, there's NEVER a crowd on the leading edge), driving a boatload of exposure, traffic and MASSIVE sales to your own websites through your own links in your PDF reports. Haven't you ever wished there was a "no cost", "no effort" way to make your products stand out from the crowd? Wouldn't it be nice if you had the power to give fellow markets the added boost they need to ignore the rest and promote the best - YOUR PRODUCT? Makes recruiting affiliates to promote your products and earn you money 24 hours a day-7 days a week, a breeze. Delivers an incredibly easy way for you to earn money hand over fist with little effort on your part. Sends traffic and sales through the roof as your product gains more exposure. Offers you a UNIQUE selling proposition with this one-of-a-kind software. Brings the world to your doorstep by making your product available to an insane amount of people and flooding your bank account with cash. You see this amazing breakthrough new software will almost magically help you rebrand PDF's easily and effortlessly - Guaranteed! Listen my friend, I won't beat around the bush here... that time is NOW, and if you know what's good for you, you'll jump on the bandwagon before it's too late. Discover How To Use The Easy Viral PDF Rebranding Software To Automate Your Marketing Efforts Like A Virus! "The Most Simple And Easy To Use Set Up I Have Ever Seen..."
Wow, I love this rebrander, I cant believe you are just practically giving it away. I would have kept coming back and buying it over and over again for every site I use it on. This is the most simple and easy to use set up I have ever seen. Did I already mention that I love it? You'll be ASTONISHED at the profits you can make in a very short period of time. Based on the infamous 'Viral Marketing' concept - The Easy Viral PDF Rebrander is all about making it as easy as pie for you to create a product SO valuable that people are fighting hand over fist to share your maketing message with everyone they know. Use the software to sweeten the pot by allowing affiliates to add their own affiliate ids and PROFIT from your amazing message. In my experience, it's a win-win situation. In fact, viral marketing is the ace in the hole for affiliate marketers in ANY niche because it's FREE. Better yet, it can skyrocket your profits and explode your subscriber list. How in the world can you beat that? Say good bye and good riddance to mySQL databases and complicated installation procedures. Simply upload to your server and BAM you are in business! Hide YOUR affiliate links and sprinkle them in your PDF files. In short, it can create huge wonders for your online business. So if you're not taking advantage of it, now is the time to start! Other rebranding tools simply pale in comparison. Rebrand from PDF to PDF. Never again struggle through making your report an HTML document. Just use your favorite word processor, or the free one I give you. Choose how rebranded PDFs are delivered. You can even automatically host the rebranded reports on your server for affiliates to give away. Have complete control over the rebranding. It's hosted on your server, and you can make whatever changes you want to it. No monthly fees, and no worries about having your reports removed at the whim of an external site owner. Automatically give affiliates the links to join the affiliate programs in your report so they can join under you if they have not yet. You are throwing away easy commissions if your rebrander doesn't allow you to do this. Based off this alone I have earned thousands of dollars. Perform rebranding on the fly from any web browser, saving affiliates the time and effort associated with downloading and using another brander tool. Get it all set up in under 5 minutes. This is the easiest script you will likely ever install. No mySQL databases to fool around with! Enjoy a script so simple to use and so well documented, you'll be able to totally customize it to fit your every need. So, let me ask you this... what are you going to do? You can create a PDF report that is filled to the brim with valuable information that your target market will eat up and allow others to "giveaway" your report (that's embedded with your own links of course), and worry if you're doing it right. Stop. Isn't that the old way of viral marketing? Isn't that time consuming and no fun? Now let the most incredible new software in the history of viral creativity almost do the marketing for you! Upload the script to your server. Upload your PDF to your server. Complete a short form to set it up. Surprisingly enough, that's all there is to it. Just follow the easy screen prompts and watch for the big bucks to start rolling in. The actual rebranding is so easy. All you do is enter your affiliate ids, and click "Rebrand"! Just check out the demo below. Your browser does not support iframes. Click here to rebrand. So if you buy Easy Viral PDF Rebrander right now, it's only $47. Just $47 and you can start making more money than you ever thought possible, drive loads of traffic to your website, and build a massive list with your very own copy of Easy Viral PDF Rebrander. Why not upload Easy Viral PDF Rebrander right now? And what if you LOVE THIS SOFTWARE? What if all your marketing efforts become easy and almost effortless? What if the tips, tools, tricks, and more on the program are so good you'll SMILE and laugh all the way to the bank? Specify the fields others will be able to rebrand - giving you total control over your products. Produce mind boggling profits by rebranding an unlimited amount links inside your PDF file. Guarantee no more lost sales by setting default values making sure that anytime others fail to fill in their links (and this DOES happen), it will be replaced with your own ones. 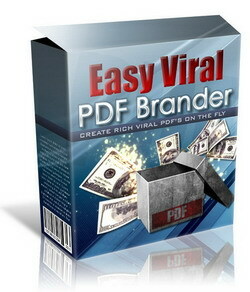 Click Here to Buy the Easy Viral PDF Rebrander Right Now for Only $47! Drop Everything Right Now and Order This Tool! Easy Viral PDF Rebrander will do more for you in less time than any other tool on the market today. Just think about all the possibilities, the increased sales, and enormous amounts of traffic you will gain by simply using this one tool! C'mon, do yourself a favor and get it now. This is the real deal and you'll be totally blown away. Don't see the big add to cart button above? Then click here. If you are not 100% satisfied within 60 days with Easy Viral PDF Brander, I will personally issue you a timely refund of the full purchase price. Go ahead - take these words as a challenge and prove to me, and to yourself, that the Easy Viral PDF Brander is a magical tool that will effortlessly skyrocket your profits and help persuade the masses to promote your products for you - even while you sleep! "Rebrand... Without All The Headaches!" I have been building my business with viral reports for a few years. It's hard enough to find quality content that people want to share but when you start asking them to download and install complicated rebranding software it creates all sorts of problems. With Easy Viral PDF Brander my customers can now rebrand reports quickly and easily and start sharing them without all the headaches. Thanks so much! I confidently guarantee that you will be completely satisfied or I'll refund your full purchase price and you can even keep the bonuses. All the risk is on us. Be bold and have a spectacular day! P.S. Don't let procrastination, hesitation or fear stop you from increasing your profits. With a full 60-day, unconditional guarantee, you have absolutely no risk, and everything to gain! It's a no-brainer. Seize the opportunity. P.P.S. My customers absolutely love the software, and have been trying to convince me to raise the price. I think I'm starting to see their point. Take advantage of this excellent offer before I overcome my inertia and follow their advice! Click here to order now!